Mesenchymal stromal cells have emerged as potential candidates for cell-based therapies to modulate the immune response in organ transplantation and repair tissues after acute or chronic injury. Preclinical studies have shown convincingly in rodent models that mesenchymal stromal cells can prolong solid organ graft survival and that they can induce immune tolerance, accelerate recovery from AKI, and promote functional improvement in chronic nephropathies. Multiple complex properties of the cells, including immunomodulatory, anti-inflammatory, and proregenerative effects, seem to contribute. The promising preclinical studies have encouraged investigators to explore the safety, tolerability, and efficacy of mesenchymal stromal cell–based therapy in pilot clinical trials, including those for bone marrow and solid organ transplantation, autoimmune diseases, and tissue and organ repair. Here, we review the available data on culture-expanded mesenchymal stromal cells tested in renal transplantation, AKI, and CKD. We also briefly discuss the relevant issues that must be addressed to ensure rigorous assessment of the safety and efficacy of mesenchymal stromal cell therapies to allow the translation of this research into the practice of clinical nephrology. These beneficial effects are the results of multiple and complex actions linked to a wide spectrum of immunomodulatory, anti-inflammatory, and proregenerative properties of the cells. MSCs modulate both the adaptive and innate host immune systems by preventing T1,24–26 and B27 cell activation and proliferation, stimulating the production/expansion of CD4+FOXP3+ regulatory T cells (Tregs),28 and impairing dendritic cell maturation29,30 as well as by reprogramming monocytes and macrophages from a proinflammatory to an anti-inflammatory state.31,32 At the local renal tissue level, MSCs decrease tubular cell apoptosis11 and reduce oxidative stress.11,33 Moreover, these cells promote angiogenesis (favoring vascular supply),34,35 reduce inflammatory cell infiltration,36 and exert antifibrosis actions.15,37 Altogether, these beneficial effects contribute to repairing kidney damage.8–16 MSCs and their secretome also recruit resident progenitor cells and stimulate proliferation/differentiation of injured tubular cells, accelerating renal repair33,38 (Figure 1). 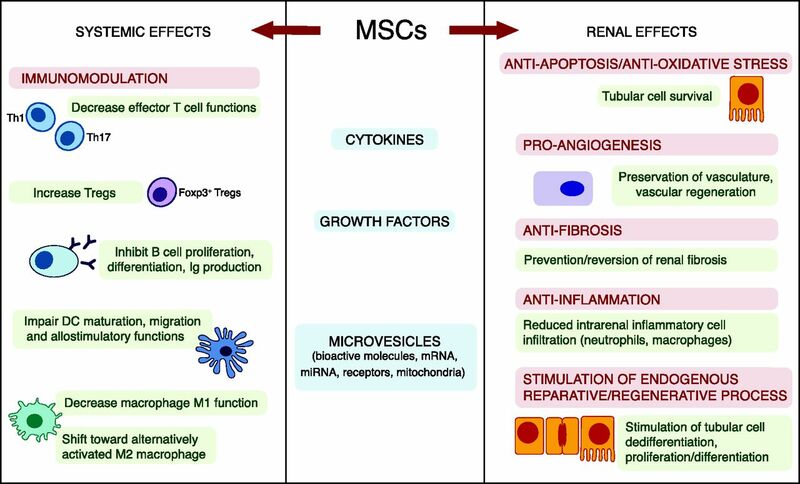 MSCs exert their potential beneficial effects both systemically and at the renal level. MSCs, either constitutively or through crosstalk with target cells, release a multitude of cytokines, growth factors, and microvesicles that can inhibit the inflammatory functions of adaptive and innate immune cells and promote the development of regulatory cell populations, such as CD4+Foxp3+ Tregs, M2 macrophages, and myeloid-derived suppressor cells (MDSCs), with their own renoprotective effects. MSC secretome protects tubular cells from apoptosis and oxidative stress, favors angiogenesis, prevents/reverses renal fibrosis, inhibits inflammatory cell infiltration, and stimulates the endogenous process of renal repair. DC, dendritic cell; miRNA, micro RNA; Th, CD4+ T helper cell. Promising preclinical studies have encouraged investigators to translate this novel therapeutic approach into clinical application to explore the safety and efficacy of MSC-based therapy. Pilot clinical trials have explored MSC administration in conditions ranging from bone marrow (BM) and solid organ transplantation to autoimmune diseases and tissue and organ regeneration.7,39–42 In this review, we focus on the available safety and preliminary efficacy data on culture-expanded MSCs tested (Table 1) or currently being tested (Table 2) in kidney transplantation, AKI, and CKDs, specifically DKD, renovascular disease, and lupus nephritis. We also discuss the critical issues that will need to be addressed to definitively determine the risks and benefits of MSCs in clinical nephrology. Accordingly, the MSC populations that have been tested or are currently being tested in clinical trials in patients with kidney diseases vary widely in tissue source (BM, UC, or adipose tissue), whether they are of autologous or allogeneic origin, and whether they come from academic facilities or commercial manufacturers (Tables 1 and 2). These differences may underlie at least some of the inconsistencies observed in the results from clinical trials conducted to date. Lifelong, nonspecific immunosuppressive drugs, although essential to preventing allograft rejection, impose a substantial risk of morbidity and mortality and hinder tumor immunosurveillance.52–55 Given the immune-regulatory properties of MSCs, these cells have been administered to transplant recipients with the hope of tipping the balance between effector and regulatory pathways and eventually promoting the host potential to control the immune response to the allograft without the use or with minimal use of immunosuppressive drugs. To date, this possibility has mainly been explored in kidney transplantation.7 Results from MSC-based therapy in kidney transplant recipients are, however, available from only six phase 1 clinical studies (four using autologous56–60 and two using allogeneic MSCs61,62) (Table 1), all with cells prepared by academic laboratories. Twelve studies in kidney transplant recipients are still ongoing, with no outcomes publicly available yet (Table 2). The translation of the post-transplant MSC infusion protocol back to a kidney transplant model in mice confirmed the development of acute renal insufficiency and showed that it could be avoided by performing cell infusion before the transplant.6,7 The model also helped to clarify that, in the setting of post-transplant MSC infusion, the postsurgery subclinical inflammatory environment promoted the recruitment of MSCs into the graft, where the cells amplified the inflammatory process through complement activation and proinflammatory cytokine release.6 The clinical protocol was amended accordingly, and two subsequent patients who received MSCs before transplant surgery did not experience engraftment syndrome.7,57 All MSC-treated patients are still being followed 5–8 years after transplant, and they have stable graft function and no major adverse effects. Extensive longitudinal immunomonitoring of these patients has also revealed that MSC infusion is associated with an increased ratio of circulating CD4+CD25+FOXP3+ Tregs to memory CD8+ T cells, long-lasting donor-specific hyporesponsiveness of CD8+ T cells in ex vivo cell-mediated lympholysis tests,7 and development of the B cell signature reported to be associated with spontaneous and induced immune tolerance.63 Notably, none of the MSC-treated patients developed donor-specific antibodies, at variance with historical matched control kidney transplant recipients given only the same immunosuppressive therapy. This protolerogenic environment was remarkably highlighted in one patient, prompting us to successfully withdraw cyclosporin A and start tapering the already low-dose MMF maintenance immunosuppression (G. Remuzzi, personal communication). Similar findings have been obtained in a more recent study in India in patients undergoing living donor renal transplant given RATG as induction therapy and two intravenous infusions of autologous BM MSCs (0.21–2.80×106/kg): one infusion the day before and one at 1 month after transplant.60 With the limitations of a wide range of MSC doses in a very small number of patients and the short 6-month follow-up period, the results showed that the cell infusion was safe, and patients had excellent graft function and normal graft histology at 1- and 3-month protocol biopsies. An increase in circulating CD4+CD25+FOXP3+ Tregs and a reduction in ex vivo polyclonal proliferation of CD4+ T cells at day 90 after transplant compared with baseline were also found, suggesting that a protolerogenic environment had developed, possibly induced by MSCs60 (Table 1). Other investigators took a different approach and examined use of MSC treatment to avoid induction therapy and minimize conventional maintenance pharmacologic immunosuppression. In a large randomized clinical trial in China, patients undergoing kidney transplants with allografts from living related donors received a double intravenous infusion of autologous BM MSCs (1–2×106/kg) at kidney reperfusion and 2 weeks later in combination with standard dose (n=53 patients) or 80% standard dose (n=52 patients) calcineurin inhibitors (CNIs).58 Patients (n=51) in the control group were given the anti–IL-2 receptor antibody basiliximab plus standard dose CNIs. Patients given autologous MSCs did not experience early adverse events (as assessed by monitoring vital signs, hematologic and laboratory parameters, wound healing, and formation of lymphocele) and showed a lower incidence of opportunistic infections than controls exhibited over 1-year follow-up. MSC treatment resulted in a lower incidence of acute rejection at 6 months but not at the 1-year follow-up and better estimated renal function during the 1-year follow-up compared with the control group, suggesting that MSC-based therapy could replace basiliximab induction therapy and enable the use of lower CNI maintenance doses without compromising patient safety and graft outcome58 (Table 1). Unfortunately, this study did not provide any indication regarding the immunologic mechanisms underlying the favorable clinical outcomes of MSC infusion in this large cohort. It was also proposed that allogeneic MSCs minimize maintenance immunosuppressive therapy. Indeed, in a non-National Institutes of Health–registered Chinese trial,61 16 kidney transplant recipients were given allogeneic MSCs isolated from the BM of living related kidney donors. MSCs, delivered into the renal allograft artery during surgery (5.0×106) and given intravenously 1 month later (2.0×106/kg), were combined with low-dose tacrolimus (0.04–0.05 mg/kg per day) maintenance therapy. Sixteen control kidney transplant recipients received a standard dose of tacrolimus (0.07–0.08 mg/kg per day). All patients underwent induction therapy with cyclophosphamide (Cytoxan). During the 24-month follow-up, a similar incidence of adverse events (fever, diabetes hyperlipidemia, anemia, lung infection, and liver dysfunction) was observed in the two groups of patients. MSC-treated patients showed stable graft function, with no significant differences in the rate of acute rejection episodes or serum creatinine and eGFR values compared with those in the control group61 (Table 1). Autologous MSC infusion has also been used to treat subclinical rejection and graft tubulointerstitial injury. In a small clinical study, six living donor kidney transplant recipients whose 6-month protocol biopsy specimen showed signs of subclinical rejection and/or increase in interstitial fibrosis/tubular atrophy received two intravenous infusions (7 days apart) of autologous BM MSCs (0.1–1.0×106/kg).59 Cell infusion was associated with the resolution of rejection and interstitial fibrosis/tubular atrophy in two patients undergoing surveillance biopsies after treatment. The ex vivo immunologic test showed reduced lymphocyte proliferation in response to donor antigens without significant changes in total numbers and subsets of circulating T cells, B cells, natural killer cells, and monocytes. However, opportunistic viral infections occurred in three patients, raising some concerns about possible MSC-induced overimmunosuppression59 (Table 1). Overall, the preliminary experience with MSC in kidney transplantation indicates that this cell therapy can be used safely if combined with an adequate immunosuppressive regimen and is capable of dampening alloimmune responses. MSCs have enabled minimization of the dose of current immunosuppressants, at least in low-risk kidney transplant recipients, and in anecdotal cases in patients, MSCs have enabled the almost complete withdrawal of maintenance immunosuppressive drugs. These results allow optimism that MSC therapy may be valuable in reducing adverse effects observed with current immunosuppressive drugs and eventually, that it may prolong patient and graft survival. In kidney transplantation, the final aim of MSC therapy should be to promote donor-specific immune tolerance, eliminating all maintenance immunosuppressive drugs by a certain time after transplant, with an approach that avoids the need for the pre- or peritransplant toxic multidrug conditioning regimens required by other strategies with hematopoietic stem cells or so-called “facilitating cells” currently used to induce graft tolerance.66,67 Our initial experience indicates that this could be achievable, especially by adopting T cell–depleting biologics as an induction therapy that promotes lymphopenia-induced homeostatic proliferation, which is deemed relevant for the later development of an effective protolerogenic environment in transplant recipients. Ongoing clinical trials (Table 2) will provide more insights into and possibly further support these achievements with MSCs, and eventually, they may verify whether these findings can also be replicated in the setting of a deceased donor kidney transplantation program to benefit the largest number of transplant recipients. AKI is a great challenge for nephrologists, because disease-specific treatments are lacking, and the mainstay is supportive care. The evidence from preclinical studies that MSCs can promote tissue repair suggests a new therapeutic possibility for AKI.8–13 However, the available clinical data on the use of MSCs in an AKI setting are still meager. A recently completed phase 1 exploratory study evaluated the safety and efficacy of allogeneic BM MSCs in preventing AKI in 16 patients undergoing on-pump cardiac surgery who were at high risk of postoperative AKI due to underlying CKD, advanced age, diabetes mellitus, congestive heart failure, or chronic obstructive lung disease.68,69 MSCs were infused at low, intermediate, or high doses into the suprarenal aorta through a femoral catheter after completion of surgery. A preliminary report indicated the safety of the treatment at all tested doses. Compared with results in matched historical control patients, MSCs appeared to protect early and late postsurgery kidney function against AKI development and reduce the length of hospital stays and the need for readmission68,69 (Table 1). These positive results were not confirmed in a similar cohort of patients when MSCs were administered to treat established AKI. In a randomized, double-blind, phase 2 study (NCT01602328) (Table 1), patients experiencing AKI within 48 hours of cardiac surgery received a single intra-aortic administration of 2×106 allogeneic MSCs per kilogram (AC607; Allocure) or placebo. The trial was terminated prematurely for futility,70 because after the enrollment of 156 patients, time to renal function recovery, the need for dialysis, and mortality were not significantly different between groups. The MSC infusion was, however, safe and well tolerated71 (Table 1). Although very preliminary, these studies confirm the safety of MSC treatment and suggest that, at least in postcardiac surgery AKI, MSCs could be somewhat helpful in preventing the development of kidney injury but may be of no value as therapy to recover renal function in established AKI. There are no other ongoing registered clinical trials for the treatment of postcardiac surgery AKI, thus leaving unexplored the possibility of a potential beneficial effect of MSC therapy at doses higher than those reported so far (Table 2). A more recent trial focused on patients with advanced DKD (eGFR=20–50 ml/min per 1.73 m2) enrolled in three Australian centers; the primary outcome of this study was the safety of rexlemestrocel-L cell therapy, although it included a preliminary look at the effect on disease progression as a secondary outcome.78 Patients received a single intravenous infusion of rexlemestrocel-L at two different fixed doses (150×106 or 300×106 cells) or placebo and were observed for 60 weeks.78 Cell treatment was safe and well tolerated, and none of the patients developed sustained antibodies against allogeneic cell donor HLA. The improvement in glycemic control observed in the United States study,77 however, was not confirmed in the Australian patients with DKD cohort, possibly due to the large range of glycated hemoglobin (5.1%–11.2%) at baseline in a small number of patients enrolled. Interestingly, cell treatment associated with a trend toward stabilized or improved eGFR over the 60-week follow-up, with a more pronounced effect for patients with a baseline eGFR >30 ml/min per 1.73 m278 (Table 1). A third randomized phase 1b/2a clinical trial with allogeneic BM MSC preparation (ORBCEL-M; Orbsen Therapeutics; 80×106, 160×106, and 240×106 cells) or placebo is ongoing with patients with T2D and progressive DKD with mild to moderate renal insufficiency (the Novel Stromal Cell Therapy for Diabetic Kidney Disease Study; NCT 02585622). In addition to addressing the safety of cell treatment, the add-on value of this multinational study rests in its use of a well characterized and standardized cell product for all participating centers, longer study period (up to 18 months), and gold standard methods to measure GFR79 (Table 2). The safety and tolerability of autologous BM MSCs have recently been tested in a single-arm phase 1 clinical trial in six patients with ADPKD and eGFR ranging from 25 to 32 ml/min per 1.73 m281 (Table 1), and no cell-related adverse events were observed in MSC-treated patients during the 12-month follow-up. However, a single-cell infusion (2×106 cells per kilogram intravenously) did not significantly affect renal function decline or kidney length, an unusual surrogate index of kidney growth.81 These negative findings, albeit in a very small number of patients, are not surprising considering the patients’ advanced stage of kidney disease when MSC treatment was started and the unexplored possible intrinsic dysfunction in terms of anti-inflammatory and repairing properties of MSCs derived from patients with ADPKD, a genetic disorder. Very recently, results of a dose-escalating phase 1/2a study assessing safety and efficacy of autologous adipose tissue–derived MSCs in patients with atherosclerotic renovascular disease have been published82 (Table 1). Compared with standardized medical treatment, the infusion of MSCs into the renal artery at a low dose (1.0×105 cells per kilogram; n=7 patients) or higher dose (2.5×105 cells per kilogram; n=7 patients) was well tolerated and induced a significant increase in cortical perfusion and renal blood flow, a reduction of tissue fractional hypoxia, and stabilization of measured GFR at 3-month follow-up.82 This successful study suggests that MSCs, through proangiogenic and immunomodulatory effects, may limit vascular insufficiency and inflammatory injury in the ischemic kidney environment. Another phase 1 study of intrarenal delivery of autologous adipose tissue MSCs in patients with large vessel renovascular disease is currently recruiting patients (Table 2). This study is designed to assess whether MSC infusion before percutaneous transluminal renal angioplasty with stenting further enhances renal blood flow and restores kidney function. In contrast, the recently published multicenter, randomized, double-blind, placebo-controlled clinical trial in 18 patients with World Health Organization class 3 or 4 lupus nephritis failed to show any beneficial effect of UC MSCs.88 Unfortunately, the lack of details about the isolation and expansion procedures and the lack of characterization of UC MSCs preclude proper evaluation of the study. The conflicting results of these studies with very small cohorts of patients with SLE, almost all performed by a single center in China, illustrate the further need of larger, sufficiently powered, randomized studies with appropriate controls before any robust conclusion can be drawn about the therapeutic potential of MSCs in patients with lupus nephritis (Table 1). Overall, none of the trials in >80 patients with SLE reported any adverse events attributable to MSC treatment. Further study will be needed to determine if select patients with refractory SLE could benefit from the immunomodulatory properties of MSCs. Efforts by numerous clinical research groups support the safety and tolerability of MSC treatment (both from academic and commercial entities) in the context of kidney transplantation, AKI, or CKD. The transient renal insufficiency (engraftment syndrome) reported in two kidney transplant recipients when MSCs were infused intravenously a few days after transplant56 can be avoided by giving the cell infusion before transplant. The concern of increasing the risk of opportunistic infections with MSC treatment, as highlighted by anecdotal cases in patients,59 has been tempered by the reassuring safety data from a large kidney transplant program58 and a small liver transplant study.65 The risk of developing anti-HLA antibodies after MSC infusion will need continued assessment but has only been observed in a few patients.62 The reassuring safety profile of MSCs in patients with kidney disease is in line with the overall published information in other conditions,89 but clearly, long-term monitoring of MSC-treated patients with nephropathy should continue, especially for the potential risk of developing anti-HLA antibodies and/or cancers. The preliminary efficacy data show promise, especially in kidney transplantation and renovascular disease; nevertheless, the road to clinical implementation of this therapeutic approach is hindered by our still limited knowledge of MSC mechanisms of action in vivo. Greater understanding of the mechanism will help define the best administration route, cell source, and dosing. As shown in animal studies9,90–95 and a few human studies,56,96,97 whether MSCs are administered by systemic intravenous infusion or the intrarenal artery affects cell localization and shapes the plasticity of the anti- or proinflammatory phenotype.98–103 Establishing how environmental factors modify MSC phenotype and function is, therefore, crucial to informing the design of large clinical trials to optimize the therapeutic potential of these cells. Thus, efficacy trials of MSC-based therapy should also include long-term mechanistic studies, and as much as possible, methods should be standardized to facilitate comparison and data sharing. The heterogeneity of MSC preparations represents an important barrier to comparison of clinical trial outcomes and remains problematic for the clinical translation of this therapy. Methods to purify the MSC population are currently being investigated, with the aim of isolating a specific cell subpopulation with efficacy similar or superior to that of the heterogeneous MSCs currently used.104 Although this approach will enable the development of a clinical-grade allogeneic homogeneous cell population to be used for future clinical trials, it is not without challenges.50 Indeed, the lack of specific cell markers for MSCs makes it difficult to isolate an effective cell subpopulation from the initial heterogeneous cell preparation. Furthermore, extensive ex vivo expansion of BM- or UC-derived MSCs is required to generate a sufficient number of cells for treating a given patient cohort. This is a major challenge, because MSCs lose immunosuppressive and trophic potency over time during culture.105,106 The development of robust potency assays to be applied during MSC ex vivo expansion and optimization of culture conditions would provide evidence of persistent key therapeutic effector properties of the cells before storage. This further highlights the importance of using only MSCs that have been characterized and generated as a standard product for clinical studies. Also, the debate regarding the cell dose and whether single or repeated infusions should be used for a given outcome are far from being solved. MSCs have been and are being infused in patients with kidney diseases at the doses of 0.1–5.0×106 cells per kilogram, a range chosen empirically according to previous MSC experiences in patients with hematologic diseases and the expected number of cells achievable by ex vivo MSC expansion. Therefore, well designed dose-finding studies as well as proper cost-effectiveness analyses are still needed before moving this innovative cell therapy to widespread clinical trials. Even with these unknown factors and much work to be done, we predict that, over the next decade, the translational gap between scientific observation on MSC function and clinical application will be bridged. We see an optimistic future for cell-based therapies of kidney disease. This work was supported by the European Union’s Horizon 2020 Research and Innovation Program under grant 634086 (the Novel Stromal Cell Therapy for Diabetic Kidney Disease Study) and the Fondazione Associazione Ricerca Trapianti (ART) per la Ricerca sui Trapianti (Milan, Italy).